Celebrate an anniversary, birthday, or exciting life event with a vibrant bouquet of flowers. 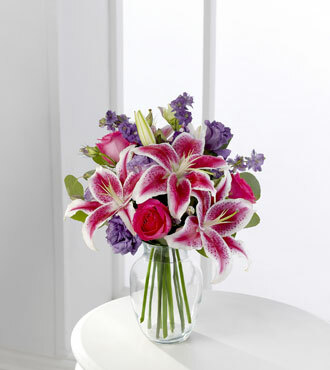 This fun and celebratory arrangement features star gazer lilies and striking hot pink roses that are ready to pop. A delicate mix of lisianthus and larkspur adds a dash of purple to the bunch for a truly bright and beautiful display. These elegant and fragrant flowers are picked fresh by local florists and arranged with eucalyptus in a beautiful glass Rose vase.